Rising into the clouds on the continental divide is the Talamanca mountain range, home to the mountain rain forest, or cloud forest. The region, which includes largely unexplored areas, is home to birds such as the Quetzal (pharomachrus mocinno) and several species of the Trogon family, making it an ideal destination for serious birdwatchers, and mammals such as the Jaguar and the Ocelot. None of the mountains of the Talamanca range is considered volcanic. Its complete geological structure includes marine sediments, lava and igneous intrusions. 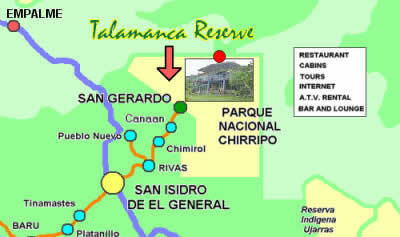 The Talamanca range is accessible through the Interamerican Highway, which makes it an ideal destination when in route to or from the Osa Peninsula and Corcovado National Park.